Out of the three provinces that hold shares of the Salzkammergut, the one of Salzburg might be the smallest - but with Lake Fuschlsee, Salzburg has one of the most picturesque spots not only of the Salzkammergut, but all of Austria. It′s a shame that the pretty village of Fuschl by the shores of the lake has turned into a summer tourism hotspot rivalled only by the province′s capital. Small pensions and B&B-like places occupy pretty much every other former farmhouse in the village, alongside with some proper hotels. Many visitors are surprised to learn that the actual population of Fuschl is around 1,400 residents. Apart from hiking and water sport tourism, it is one company in particular that shapes Fuschl these days: The international headquarter of Red Bull, the energy drink that gives you wings, can be found just outside of the village in a pretty cool building by the lake. Following the road in this direction, you will get to Schloss Fuschl Castle, which now serves as a hotel and restaurant primarily to financially potent visitors of the Salzburg Festival. For those who are rather interested in the crystal clear lake, a hike all around it takes approximately four hours, is rather easy (meaning, no steep cliffs or anything alike) and has some rewarding vistas to offer. 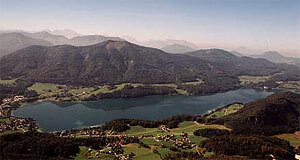 The lake, by the way, is so clean that it serves as a water reservoir for the province of Salzburg. The Lake stretches over four kilometres, but is only approximately one kilometre wide. Lake Fuschlsee water meets the standards of tap water in Austria - meaning that you could drink it if you could access deeper levels, where water birds and algae can′t get to. Moving in the opposite direction - up instead of down - you can climb the local Filbling Mountain for an easy hike. On this route, you will get to the small Lake Filblingsee. The hike is fairly easy and very scenic - mountain and lake belong to the Red Bull "founder" and multimillionaire Didi Mateschitz. A more Alpine and challenging hike would be one to the Mount Schober. Starting from just underneath the ruined castle Burgruine Wartenfels, you can ascend to the cliffs of the summit and walk back down on the other side, thereby enjoying great views on the surrounding lakes and mountains. From the summit you can see the town of Mondsee with its mighty monastery church. In case you think this hike is difficult: I first did it with my father at the age of six and you are likely to encounter people with children on their way upwards. Other attractions nearby include the previously mentioned Mondsee; various mountains and lakes of the Salzkammergut; St. Gilgen and St. Wolfgang, as well as the villages of Lake Attersee. Thanks to the highway, the connections between Salzburg and Fuschl are excellent for those who have their own car.